PROTECTS AGAINST ABRASION with BARRITEX? protective lining. IDEAL FOR NEOPRENE DRY SUITS, WADERS AND WET SUITS. Also for neoprene gloves, boots and accessories, orthopedic supports, lycra body suits and other non-neoprene articles. Hundreds of uses including personal 'I.D.' marking and numbering systems. 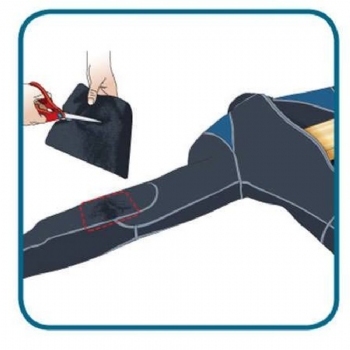 BARRITEX PROTECTIVE LINING - BARRITEX is an abrasion resistant yet flexible and waterproof substrate which is an integral part of IRON MEND repair fabric for neoprene. The BARRITEX layer is 'sandwiched' between IRON MENDs nylon fabric surface and its bottom layer of urethane adhesive. 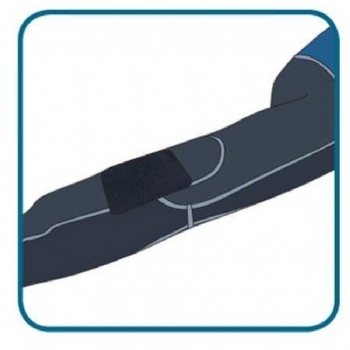 BARRITEX is designed to help increase neoprene life especially when IRON MEND is used to protect against abrasion. IRON MEND HEAT SHIELDING PAPER - IRON MEND Heat Shielding Paper is a unique reusable and heat stable paper used to protect neoprene garments from excessive heat. IRON MEND Heat Shielding Paper allows heat to pass through its surface yet it creates a buffer to help prevent scorching of fabric. 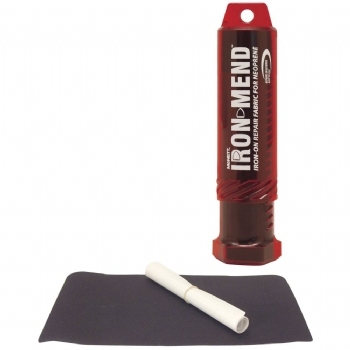 IRON MEND should not be used without heat shielding paper. The full sheet of our shielding paper should be used during all IRON MEND repairs (regardless of repair size) to help protect surrounding neoprene from potential damage from overheating. Wash and completely dry neoprene article. NOTE: All neoprene articles may be cleaned with McNett Wetsuit and Drysuit Shampoo. Pre-heat Iron. Set iron temperature to ACRYLIC setting. NOTE: This setting may be LOW or DELICATE on some irons. Do not use steam. 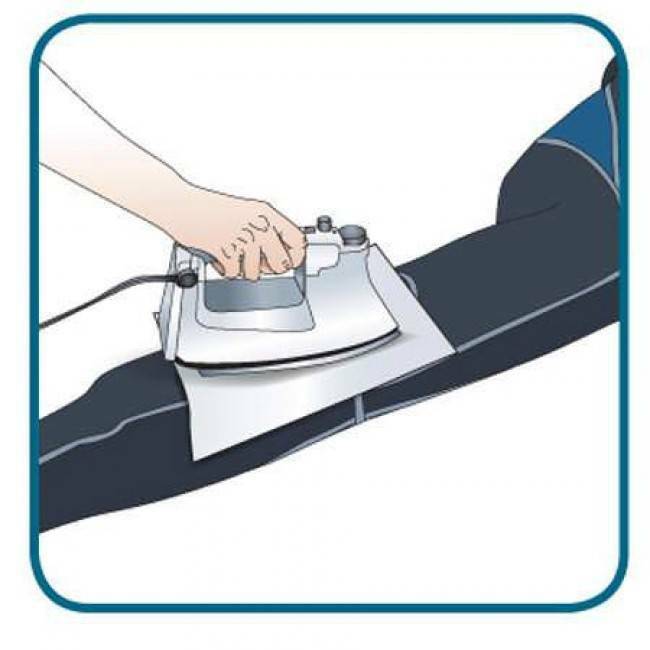 Do not use travel size irons. IMPORTANT WARNING: DO NOT OVERHEAT IRON. ALWAYS USE IRON MEND HEAT SHIELDING PAPER BETWEEN IRON SOLE PLATE AND AREA TO BE REPAIRED. IRON SHOULD NOT COME IN CONTACT WITH NEOPRENE SURFACE. An overheated iron may cause damage to neoprene. Never use an iron heated beyond the recommended settings or above 275? ?F (135??C). 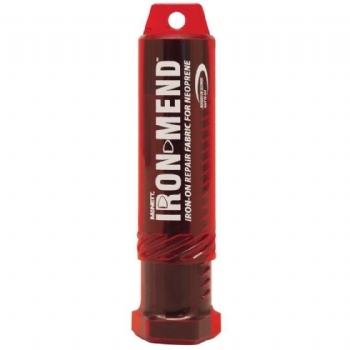 Iron should be in good mechanical condition, free of unexpected temperature fluctuations. To test heat settings, pre-test with a small piece of IRON MEND on a non-critical part of the garment, eg. ; inside leg or sleeve. Cut IRON MEND with scissors to overlap damaged area by 3/4 inch. Put damaged garment on firm, flat surface prior to repairing. 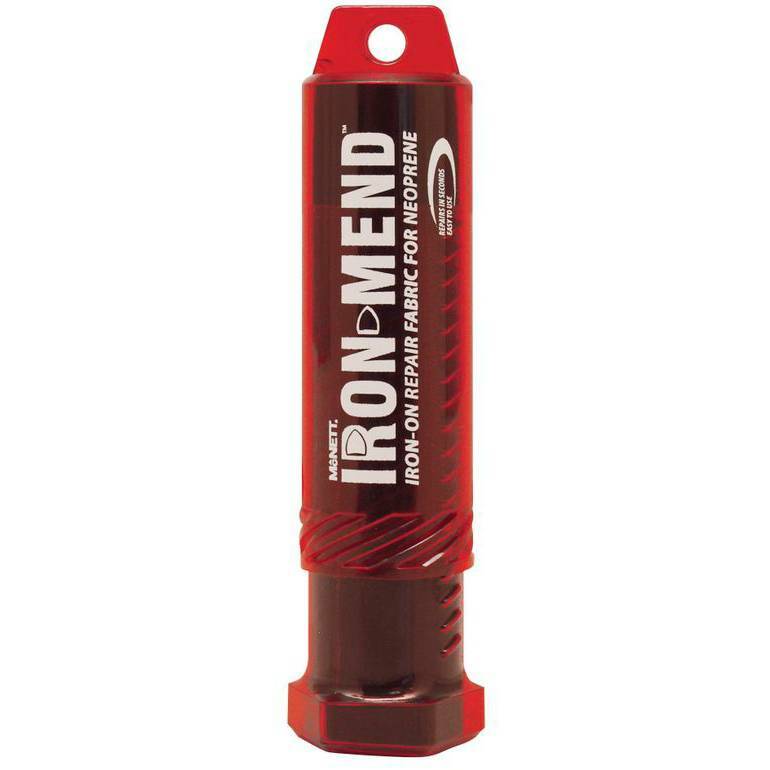 Place IRON MEND patch over the damaged area with the urethane coating side down. Place full sheet IRON MEND heat shielding paper carefully over IRON MEND patch. With preheated iron, press IRON MEND down with firm even pressure for 10 seconds. Lift and rotate iron and apply for another 10 seconds. Allow repair to cool for a few minutes before testing for secure adhesion.